If you have either the Professional or Ultimate editions of Windows 7. Download Microsoft’s free Windows XP Mode virtual machine and install the Oracle 9i client in that virtual machine. You should be able to create an icon that automatically launches the Windows XP mode virtual machine and then runs a specific program inside the virtual machine (I have not yet tested the auto-launch feature). If the programs will use an ODBC connection, install one of the Oracle clients, create the ODBC connection that will use that client, install the other Oracle client, and create the ODBC connection that will use that client. Modify the environment and start the program that will access the database using that modified environment. If we were using this approach to start an application program that uses a specific Oracle home, it probably would make sense to change the properties of the shortcut to run using a minimized window to prevent a brief screen flash to black when the batch file executes. 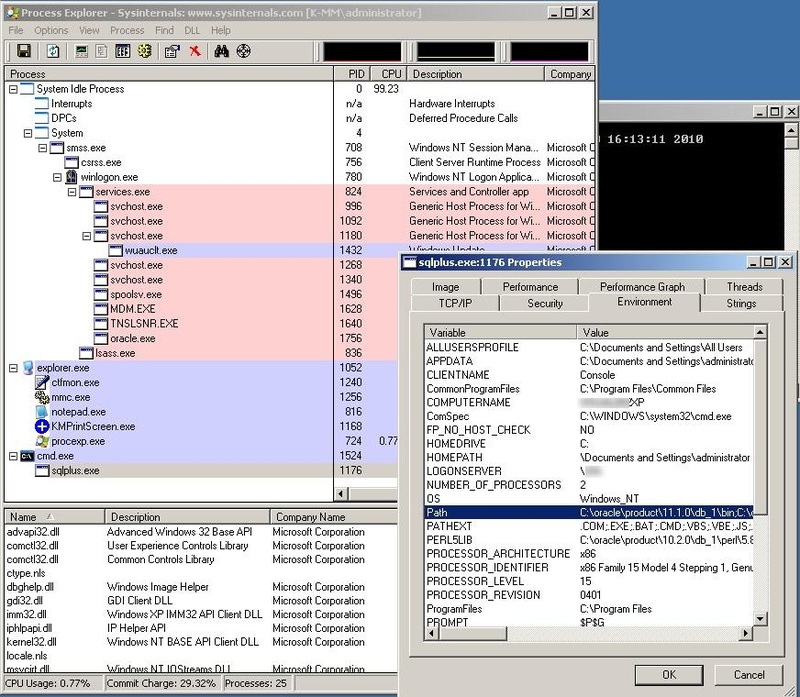 Nothing to do with Oracle, but our MIS manager has been running 64 bit enterprise 7 for a while with the XP mode, and has run into several incompatibilities, including the print drivers available working differently enough from real XP to blow off what our production users would need to use. It’s starting to be a problem as we need to replace older stuff. I’m sure there will be some workaround, but I’m glad I can stay on the db side most of the time. Thank you for the information. I need to spend a little more time experimenting with XP Mode. 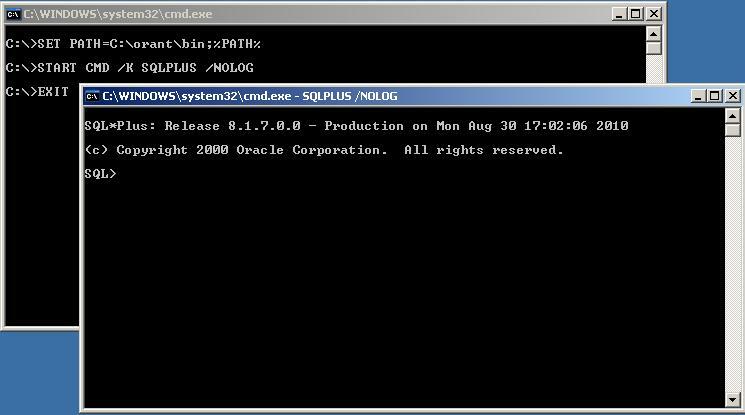 So far I have been unable to install Oracle Database 10.2.0.3 in XP Mode – the install stops at about 83%, complaining that it cannot find a file. I might have a corrupt installer package. Letting installer programs “reboot” the virtual machine is also problematic. That is interesting that printer drivers are having problems in the virtual machine. Are these network printers or local printers? If local, are they attached by parallel port or USB? Network printers. The people involved resolved the problem somehow, but I didn’t get what they did. But the app still doesn’t show network printers on shared drives without twiddling about in its advanced settings. Thank yout for the additional information. I wonder if the network/server administrator had to load 32 bit drivers on the server, so that the 32 bit XP Mode could automatically download the correct drivers when it connected to the network printer. In fact, as you can read in MOS note “Client / Server / Interoperability Support Between Different Oracle Versions [ID 207303.1]”, only databases as of 9.2.0.4 are support by a 11.1 client. Thank you for pointing out the documentation error (Database Upgrade Guide 11g Release 1 – Introduction to the Database Upgrade Process). I thought that I remembered that the Oracle 10g client permitted connections to as far back as an 8i database, and that the Oracle 11g client permitted connections to 9i databases. However, an initial search of download.oracle.com found the above mentioned Database Upgrade Guide in the documentation, and I decided that I must have remembered incorrectly. 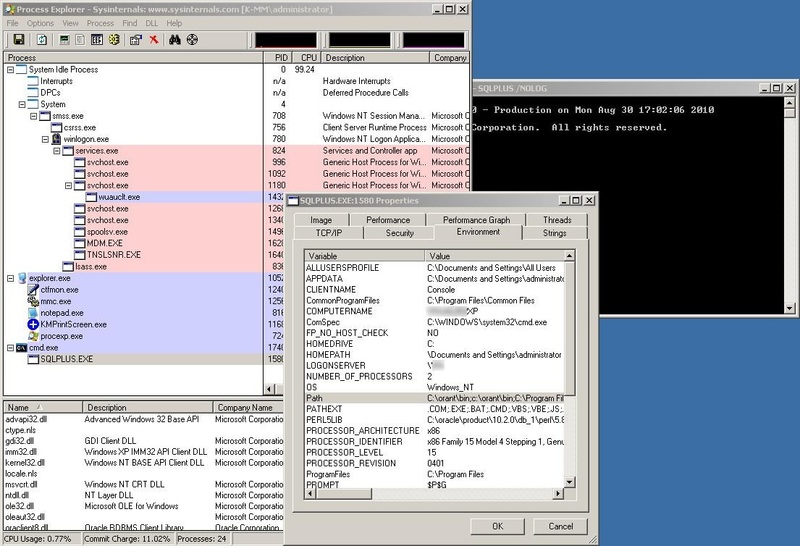 * Metalink (MOS) Bug 3437884 reports that an ORA-3134 will incorrectly result when a 10g client attempts to connect to a 8.1.7.3 databases, and that problem is addressed by using the 10.2.0.1 (R2) client rather than the older 10g (10.1.0.1, 10.1.0.2) client. * Metalink (MOS) Doc ID 844327.1 reports problems with Oracle Forms 11.0.0 connecting to an 8i database, with the only solution being to upgrade the database. 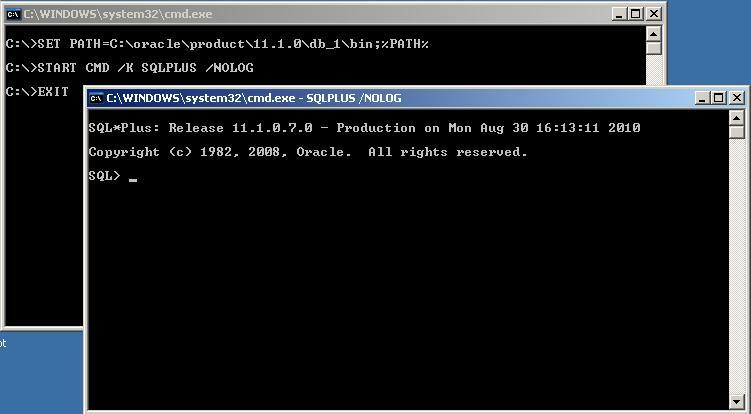 Considering the above (corrected) information, the 11g client should report an ORA-3134 when attempting to connect to an 8.1.7.4 or lower database – and that explains why the original poster in the OTN thread referenced in this blog article was attempting to use a 9i client to connect to an 8i database, while an 11g client was also installed on the same computer. Thank you again for the correction.